Valerie Lioudis, author of the zombie thriller, Aftershock: A Collection of Survivor Stories, asked me to write about how authors can use social media to market their books. Valerie specifically wanted me to write for the authors that participate in the Reanimated Writers Zombie Fiction Fan Group on Facebook. I’m flattered by Valerie’s request and I hope I don’t disappoint her and Kevin. Because before I can get into the process and tasks, I have to get into the purpose. If the purpose and grit is lacking, there really isn’t any need to proceed further. So I must ask you, fearsome author, why did you publish a book? You published your book for it to be read, enjoyed and praised. By many. More than 100. Maybe, 5000. OR you have published a book for the wrong reasons. Of course, many often say, just write. Others, write for yourself. In other words, write to understand you and, perhaps, benefit from truthful self-examination. Maybe you can fix you. Heal you. Find the path to a better you. Certainly, writing can help you do these things. But once you have an ambition to publish your writing, you seek to be known. You seek to be trusted, preferred over others, honored, praised and otherwise rewarded. You want to matter to others. Me too. Even if you possess talent, technique and style (however challenging they are for you to achieve in your work), these are not sufficient to get known. And, truth be told, a published book is not the accomplishment today that it was 100 years ago. In fact, anyone can publish a book today. And everybody seems to be doing it too! People need to see it to believe it. They need to believe it is worthy of their attention and time before they will taste it and see for themselves if it is good. Your book needs to be brought to market and it needs to succeed in a fierce competition among other books and, often, among better written books than yours. It’s great, for example, that the zombie market is huge. Last year, there were over 12 million total viewers of The Walking Dead. But how will your book get to that market of zombie fans? Your book is competing for the attention of readers against 500,000+ new Indie books per year – not to mention all the books published by the industry leading publishers with their long experience and proven strategies for selling and marketing books. Today, an accomplishment is selling 5,000 or more copies within five years of publication. Of course, there is some accomplishment in writing a book fit for publication. But the line between fitness and self-humiliation has been blurred much by the celebration of self-publication. And what self-respecting adult prizes a participation trophy?! But those with purpose and grit will succeed in the serious accomplishment with a modest financial investment. Under $1200. Do not think, however, that it’s easy to compete against millions of dollars of marketing and ad spend of the top 20 publishers. That would be some really bad maths and poor common sense on your part! With much, enduring and persistent effort to market your books and build positive and mutually beneficial relationships in social media, you can become known. My friend, business professor and author, Mark Schaefer swears it in his best selling book, Known. Building positive and mutually beneficial relationships may not be why you are on social media. It may not be how you do social media. That’s something we can easily fix if your purpose is to be an accomplished author. Since I find that most learning is actually happening when there is doing, therefore, I will only continue to write further on this subject if I see 20 retweets and shares of both of the following tweets and posts. Even if there is not enough of you do so easily, encourage your friends to retweet and share. Because that’s how social media savvy is done. Click the link below and retweet the tweet from your Twitter account. Click the link and like and share the post from your Facebook account. In a recent blog post, Nisha Varghese unintentionally revealed her daily challenges as I reflected again on what this means as she types out her daily blog posts and fundraising tweets. This morning I typed a Whatsapp message from my smartphone (because I have Cerebral Palsy I have poor fine motor skills which makes using things like a touchscreen a mammoth task) I feel a bit ridiculous celebrating a Whatsapp message but if you saw how much time and effort it took me to type a six letter word on my smartphone trust me you would be celebrating too. Her fortitude to do good is not just admirable; it is nothing less than heroic and inspirational. Imagine how I feel when I get a personally typed message from Nisha – asking me to ask each of you to give $50 to her campaign – 100 of you. It may have taken her more than an hour to write those 200 words. Obviously, I can’t tell her no. But what an wonderful opportunity! I have to try. I have to put my words to good use. I have to put my writing to Nisha’s service – or I do not know love and, failing in this, I would have to confess that I have never known love. None of which means that you are obligated by your own humanity to help me and Nisha with a $50 donation. But if you know love or say that you have known love, you might have to reblog this blogs post, share or tweet out the link, and/or give what you can. Or you could write a better blog post – one that better tells Nisha’s story and better explains her campaign. Francesco knelt in a stall as he rigorously cleaned the toilet bowl with a brush. Standing behind him, a short, fidgety man in a black suit held a box in his arms. Francesco stood up in his gray overalls and the short administrator quickly stepped back. “Awesome,” replied Francesco in a sad whisper. The little man handed him the box and Francesco looked in it to see that his personal things had been collected from the school’s basement: a framed picture of his wife and son, a bible, a pill organizer and a crumpled lottery ticket. There would be no pleasantries – not even a farewell hand shake after ten years of exceptional performance. “Mi Dispiace…” The administrator shrugged. Francesco acknowledged the insincere apology with courtesy. “Before you go, would you fix a faucet in the faculty restrooms?” asked the small man. “Si.” Francesco handed the toilet brush to the administrator. The short man received it with a sour face. This was the third of Francesco’s three part time jobs that he had been fired from in the same week. Times were hard and employment of the elderly was increasingly discouraged. Just last week, the Italian Prime Minister had called upon the nation to employ its youth. Francesco carried the box under his arm as he walked out of the college’s front door. He wore a gray suit. It was very important to Clare that he dress respectably – regardless of his station. After all, Francesco Bernadone was an educated and cultured gentleman. This – none could take from him. Down the street, a group of teenage Sudanese immigrants laughed at Francesco and imitated staggering zombies as they followed him to the bus stop. Francesco took the placard, read it and smiled. He held out his hand in friendship. The man shook Francesco’s hand and turned to go in another direction. Some steps away, the Jewish man turned his head to Francesco and spoke out. 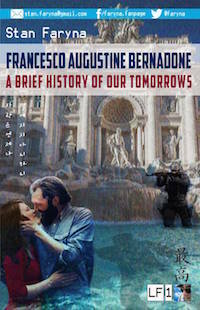 On the bus, Francesco listened to a twenty-something Asian man in jeans, navy blue sport jacket, and white tee shirt. The young man carried a metallic-canvas back pack and wore matching combat boots. He was speaking about the challenges of molecular computing with a middle-aged Caucasian man in a white, three-piece suit. The topic was interesting to Francesco – even more interesting than the fact that the man in the white suit had no shoes. “I really do think self-assembling, silver composite nanotubes are the answer to multi-threading the organic transistor,” said the young Asian man. Francesco got off at his bus stop, walked a few blocks, waved and smiled to various adults and children, entered his apartment building, and went up the abused stairwell to the sixth floor. Above the door to his apartment was a wrought iron sign holder minus the sign. At the foot of the door lay a newspaper. He unlocked the door, picked up the newspaper and went into the quiet darkness. A small, mechanical white cat waved to him from atop a curio cabinet. He didn’t turn on the lights as his neighborhood was load-sharing – the electric supply was suspended for three hours as the utility juggled the electrical needs of the neighborhoods of Rome. In the kitchen, he turned on a solar-charged radio, opened a can, and put food in two cat dishes. A female radio announcer spoke about the top news of the day. Today, 72 civilian ships were scuttled while docked at the Port of Algiers. It is well documented that the boats were all used in illegal immigration operations in the last month. The Algerian government blames these acts of terrorism on joint special ops teams operating under the command of the European Military Protectorate and NATO. No one was injured in the incidents. One Netherlands national was captured by Algerian authorities and is being held in custody as a suspect. The news faded as Francesco surveyed 12 small picture frames hung on one wall – different scenes of Clare, Cristiano and him. He missed his wife and son. His mobile phone beeped and whirred with an R2D2 ringtone. “I’ll do it,” replied Francesco. Francesco closed his iPhone and tried to put it back in his front pants pocket, but failed and it hit the floor. The screen cracked. He took a deep breath.